Home black geeks comic books geek culture Where are the Black Comic Book Superheroines? Where are the Black Comic Book Superheroines? (Huffington Post) When it comes to female comic book superheroes of any race, Wonder Woman and Supergirl are by far the world's most recognized. Yet even with their international popularity, both have failed commercially in major films and television adaptations. This failure has historically been attributed to the white, male-dominated comic book industry and media, which is often accused of being largely inept in writing, crafting and celebrating complex female superheroines. It has also been attributed to our sexist culture, which struggles psychologically with the concept of women and power. Can you tell us more about your research on black female superheroines? Why did you choose to research this? I chose this research because I wanted to provide a voice from a black woman's perspective regarding comics, especially the black female characters. Also the comic book genre has primarily been discussed from the perspective and viewpoints of white males. There is very little research that specifically discusses the black female character in comics, so this was a great way to open this door even further. What African-American superheroines are out there now? 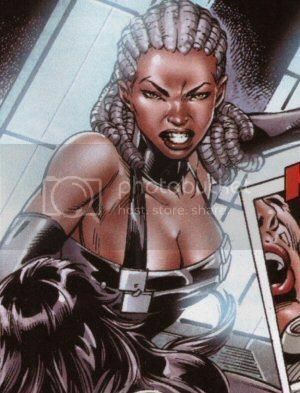 Besides the ever popular X-Men's Storm, there are a numerous amount of black female superheroes/comic characters. Some of these characters include Dark Horse comic's Martha Washington, Milestone comic's Rocket, DC comic's Vixen, Crimson Avenger, Michonne from the graphic novel The Walking Dead, Marvel's Photon/Captain Marvel,Misty Knight, Melody Rich from Brotherman Comics, and independent Black comix characters Oya, Prodigy, Amazula just to name a few. It's important to note that the black superheroine is not just in the mainstream comic world (i.e. Marvel , DC and Image ) but is quickly growing in the independent comic genre.